Attention Bro-nies and pony lovers! My Little Pony has a big announcement. Hasbro has released the theatrical poster for My Little Pony: Equestria Girls. The feature film makes it’s debut at the Los Angeles Film Festival and will be released nationwide on June 16. The premise of the film follows lead pony Twilight Sparkle on her biggest adventure yet. She must go into an alternate universe to find a crown that has been stolen from the Crystal Empire. She goes through the portal to a world that not even Princess Celestia knows about. When Twilight Sparkle opens her eyes in the new world she sees her beloved partner in crime, Spike the baby dragon, has been turned into a dog. She has two arms, two legs and her cutie mark is on a skirt, not her behind. Twilight Sparkle is transformed into a human teenage girl. Without her best ponies by her side, Twilight Sparkle thinks life looks pretty crazy. She later finds that the alter egos of her friends live in this human universe. The the trailer, she finds Pinky Pie is on the spring dance committee and Rainbow Dash is a star soccer player. Twilight Sparkle has to fight an evil queen bee for the crown she needs to retrieve. She learns even more about “the magic of friendship” and might have a love interest. 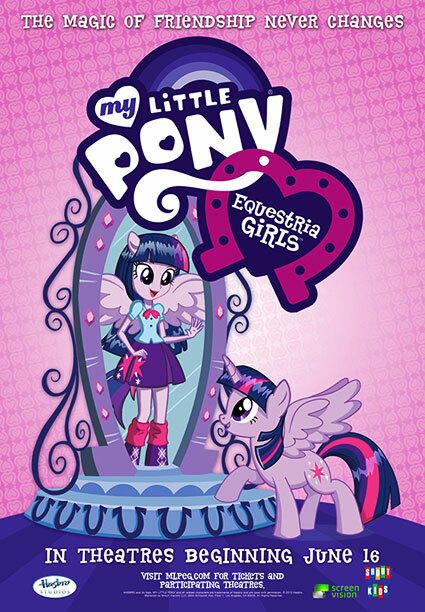 Not only will Twilight Sparkle be getting a human makeover, but all of your beloved pony girls will too. Apple Jack, Rarity, Rainbow Dash, Fluttershy and Pinky Pie sport flirty skirts, knee-high riding boots and long pony tails in promotional posters for the new line. The high school setting gives more story lines and more toy options for Hasbro.